An asthmatic will describe, if asked, that an asthma attack is like trying to sip through a straw someone is pinching three quarters closed. It is both uncomfortable and frightening and as the severity of an attack increases and if not treated could lead to life threatening situations. Symptoms can vary from one person to another, from one time to another and even be different one asthma attack to another. You could have a first asthma attack that is very severe and require hospitalization and then a few months later just have a mild episode. They usually all display signs of coughing (more pronounced at night), shortness of breath and often chest pain, tightness or pressure weighing down on the chest feeling. Some asthmatics have some symptoms almost on a daily basis and others can go long periods of time in between and asthma attacks. Others are known to only have asthma attacks while exercising or exposed to environmental triggers such as pollens or even colds. Most asthma attacks are generally mild in nature and often even without relievers the airways reopen within a few minutes to a few hours. Severe asthma attacks though rarer are more severe in nature and normally require immediate medical attention. Those who have asthma should know that there are several early warning signs of symptoms that often materialize prior to an asthma attack. Certain changes take place and are often recognizable as the earliest signs of an approaching episode. None of these will prevent you from performing in your normal day to day routine. 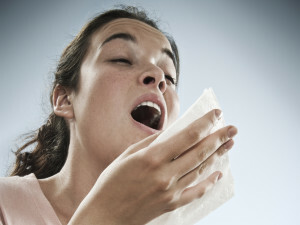 These early warning symptoms include frequent coughing especially at nighttime, quickly losing your breath or just a shortness of breath in general, feeling an extreme tired or weak feeling while exercising, fluctuations in lung functions, cold symptoms (sneezing, runny nose, congestion, cough, sore throat and headaches) and even sleep impairment. If these symptoms are recognized and treated according to your asthma action plan you could avoid or minimize the affects of an asthma attack. If the above symptoms and early warning signs are not noticed or ignored than the asthma episode will likely worsen to the point that you cannot function in normal daily activities. Severe asthma attack symptoms can include: persistent cough night or day, wheezing and shortness of breath, tightness in the chest, and no or poor response to your normal asthma medications such as bronchodilators. One of the affects of asthma that is not discussed much is the ling between asthma and depression. When people are unable to breathe the stress factor is so high that depending on the frequency of asthma attacks the risk of developing depression also increases. It is also believed that when inflammation is in the body it triggers neural changes that can modify behavior and often trigger depression or depression like symptoms such as social isolation, increased depression, poor asthma management and worsening of asthma symptoms. The symptoms of infant asthma are so subtle that most parents do not realize the child may have asthma. Coughing is about the only real symptom an infant will display when having asthma. Doctors have to depend on parents to advice them of coughing, wheezing or breathing problems the child may exhibit. The doctor will also have to take into consideration such things as past viral infections, colds, and bronchitis, environmental factors such as exposure to smoking of pollutions, is the child active, are there possible triggers in the home such as pets, dust and pollen and even changes in the weather. Even laughing and crying episodes can be clues for the doctor trying to diagnose infant asthma.